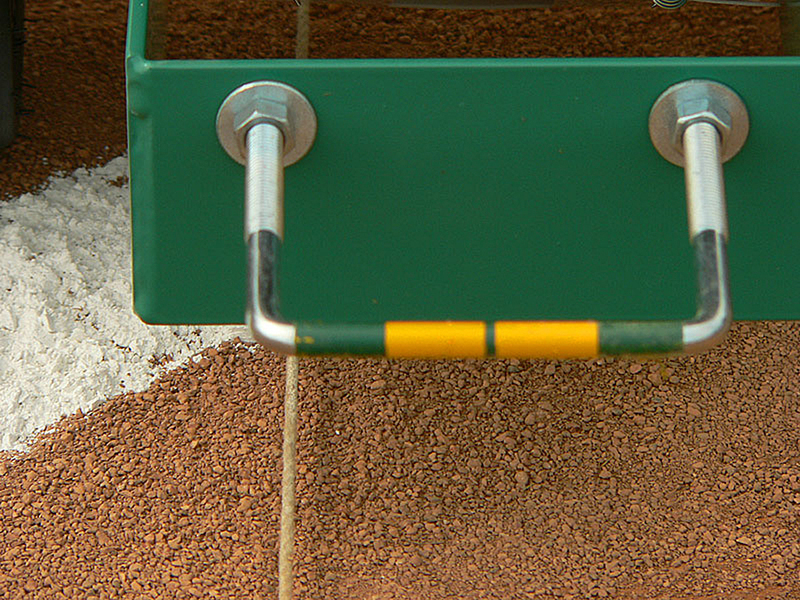 “Bridging” is a common problem. 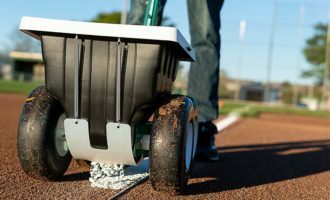 Bridging occurs when chalk settles and compacts in the hopper, and literally “bridges” across the agitator at the bottom of the hopper — preventing the free & even flow of chalk — giving you a spotty line. 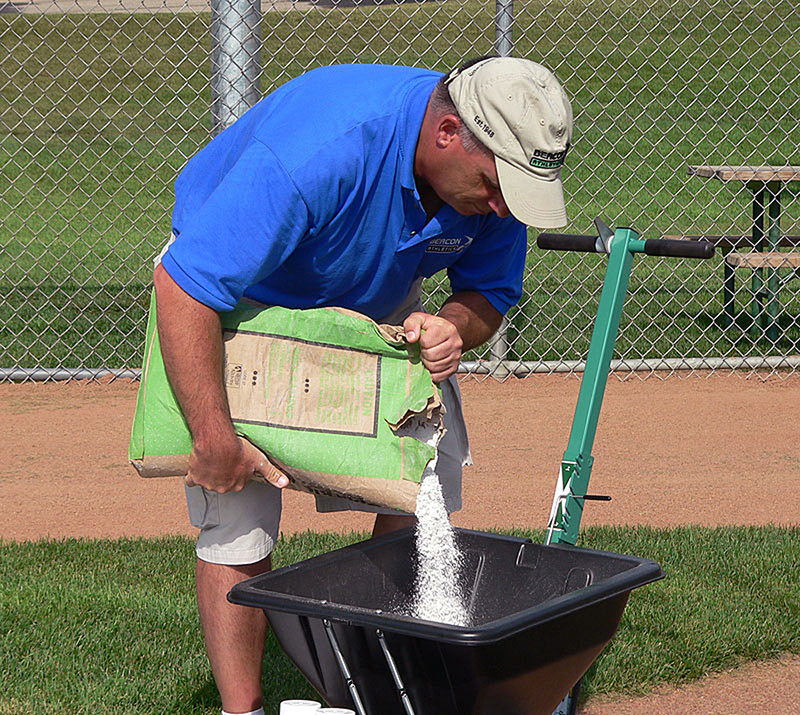 To prevent bridging, make sure you fill the hopper when you’re next to the field you’re chalking. 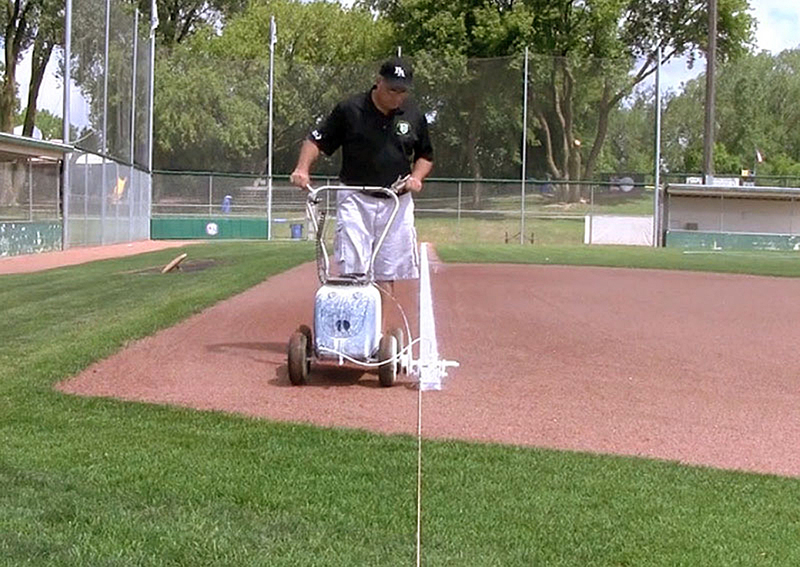 Also, only fill with as much chalk as you’ll need for that one field. 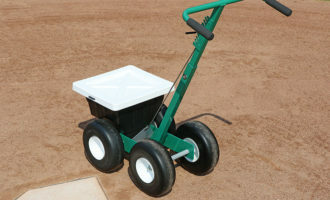 If you transport a full chalker from field to field, the vibrations will cause the chalk to settle in the hopper, bind together, and create bridging. 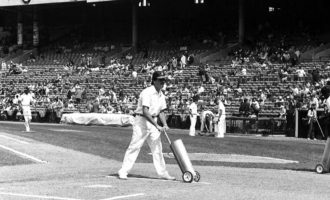 If your chalker still bridges and chalk flow is poor, have a stir stick handy to fluff the chalk and break up the bridging. 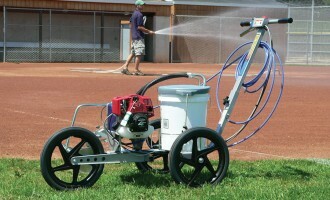 Aerosol or bulk, we have some recommendations. 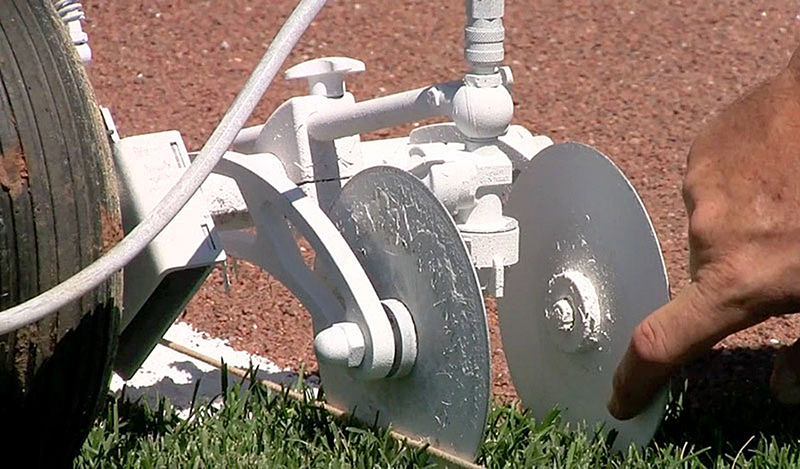 Using aerosol paint correctly is pretty straightforward. Shake the can(s) so you can hear the marble inside come loose. Keep shaking for a minute or two so the paint is thoroughly stirred. 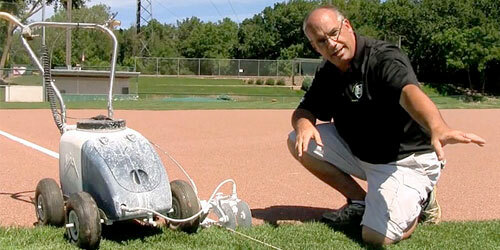 Then just invert the can, mount to your paint striper and you’re ready. 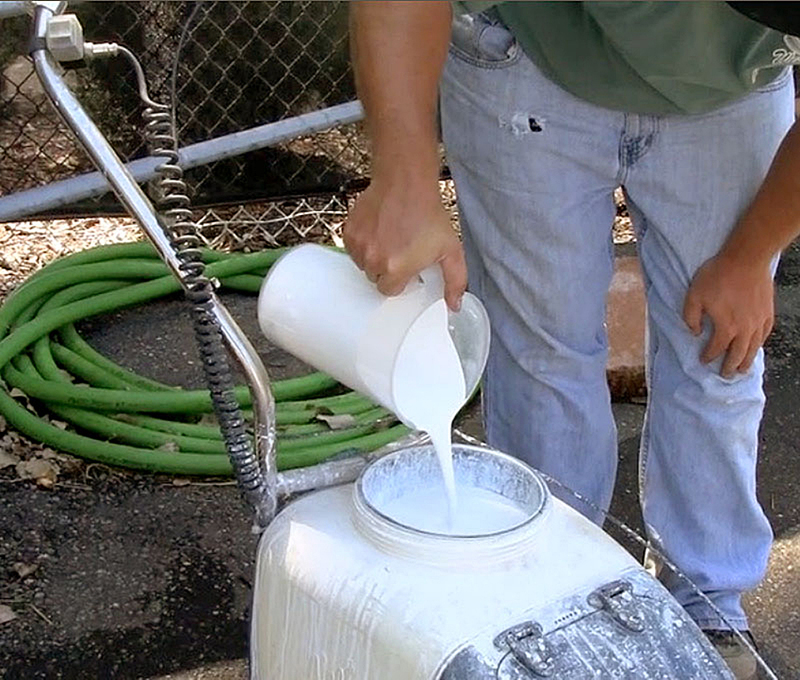 For bulk paint, dilute with water according to the paint manufacturer’s recommendation. 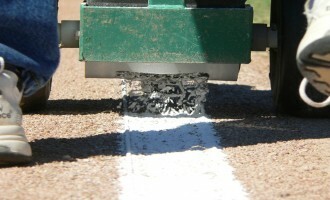 The more you dilute it, the less vivid your paint line will be. 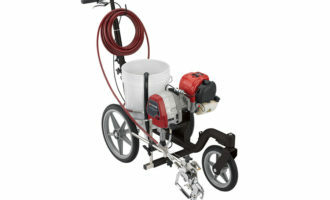 Be sure you pour the paint through a strainer to catch any contaminants that cause clogging when using the sprayer. 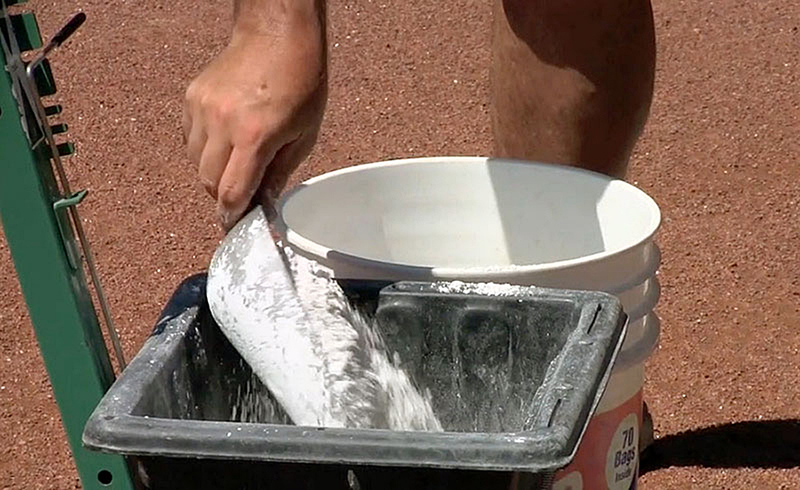 Unlike chalk, dilute and fill away from the field in case you spill. 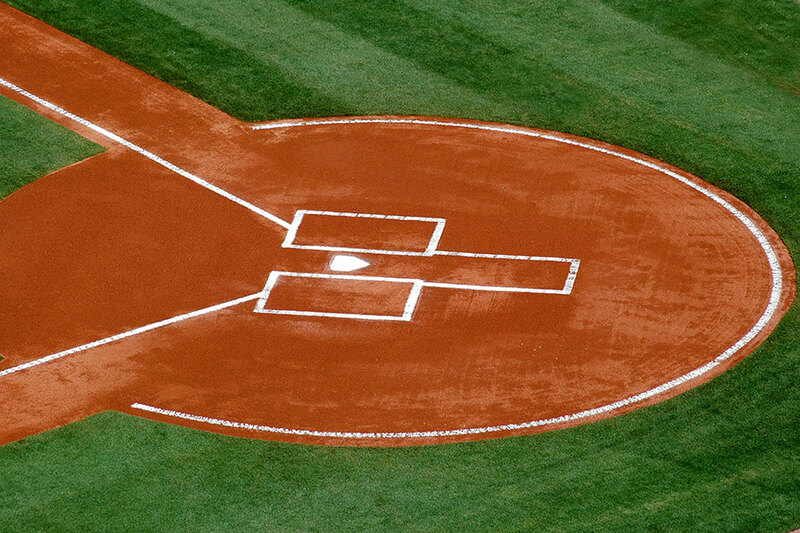 There is something you should do before you put your lines down. 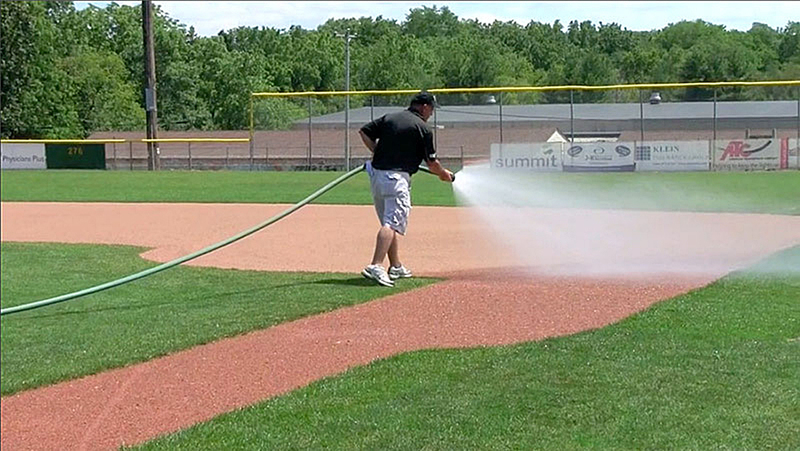 It’s a good idea to apply a light to moderate amount of water to the infield skin where the lines will be. 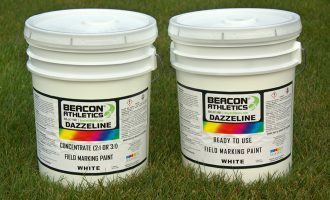 There are different, but important, reasons for this depending upon if you’re painting or chalking. 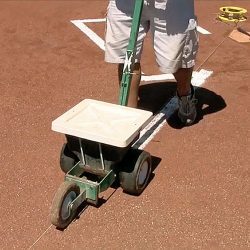 When chalking, some of the moisture will get wicked up into the chalk which helps lock the line into place, protecting it from wind. 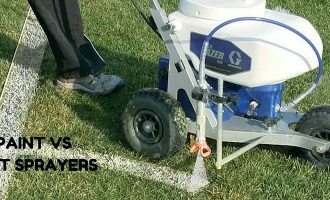 When painting, the paint sprayer itself will have a blowing effect and moisture helps to seal the actual topdressing or soil down while you’re painting. 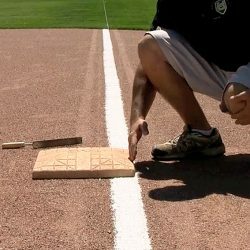 Remember, the foul line should be entirely in fair territory, meaning the foul edge of the line should align with the foul edge of the base. 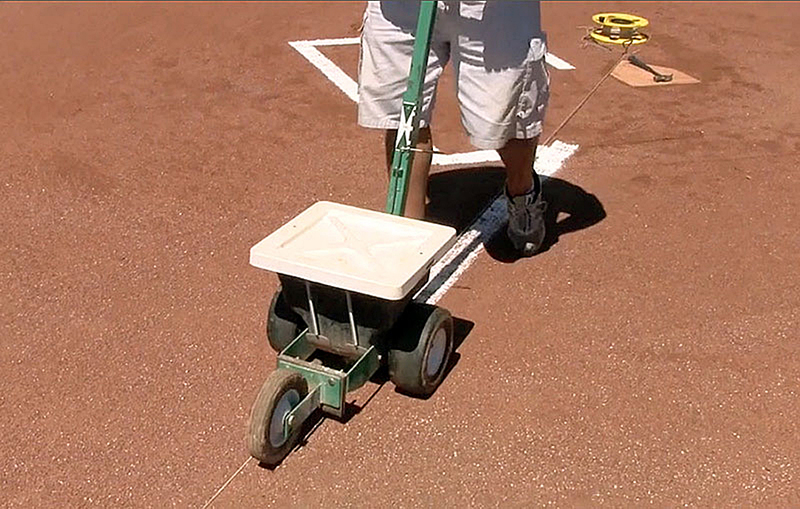 Position your chalker so its guide aligns with the string line. 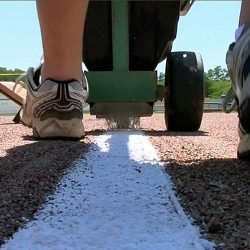 The resulting foul line should be entirely in fair territory. Click the pictures for more. 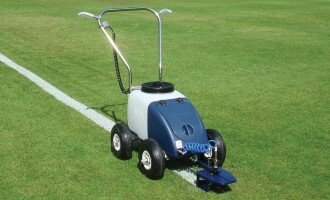 With the chalker aligned, open the control lever to the width you want and the flow rate you are comfortable with. 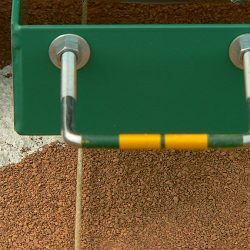 Begin walking at a consistent speed and make sure you pay close attention to the stringline and how the chalk is falling to match it. 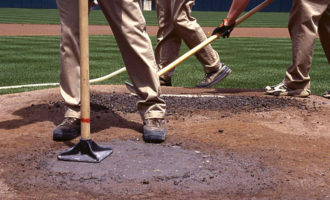 With your baseline wetted down a bit, you’re ready to paint. 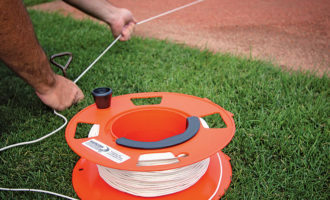 Just like the chalker, position your paint striper so the guide disks on the side align with the string line. 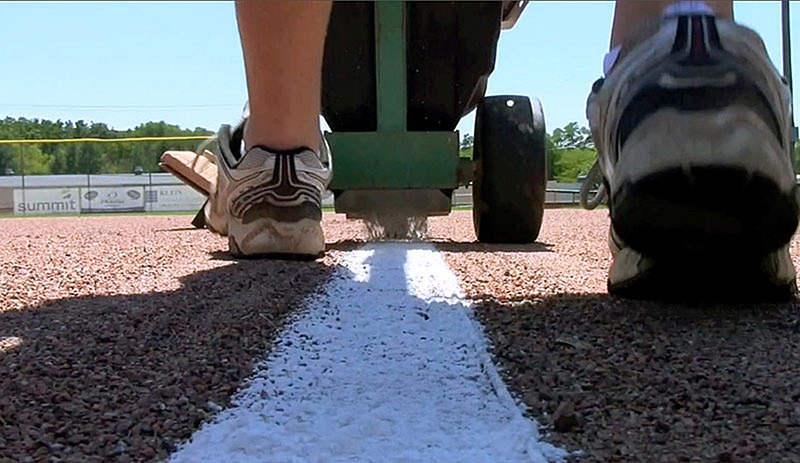 Again, the foul line should be entirely in fair territory. Click the pictures to see more. 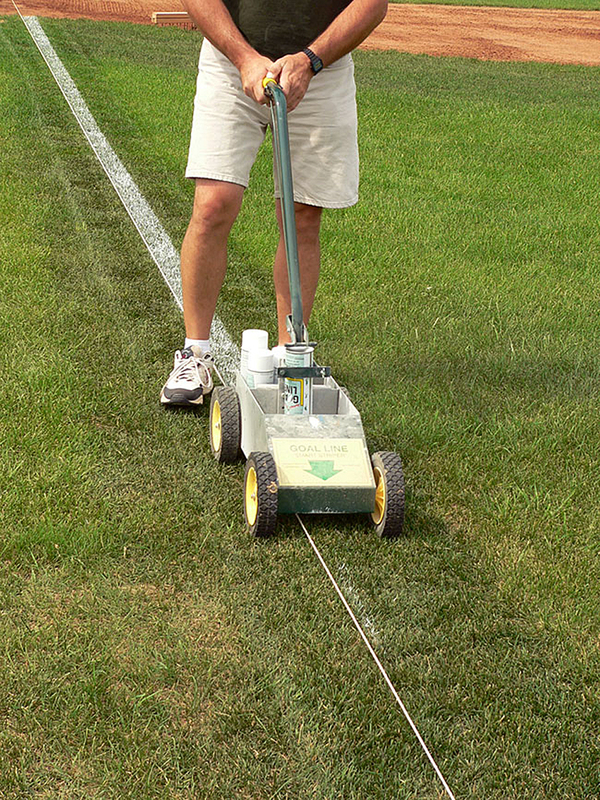 Maintain a steady pace for a clean, consistent line. 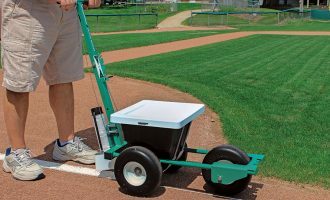 When you reach the grass, see if the grass is dry. It’s better to paint on dry grass. 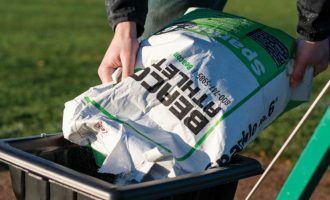 Make sure the guide disks are the correct width apart and adjust the nozzle as necessary to make sure the spray is set just wide enough to cover the full width between the guide disks. After those adjustments you’re ready to paint. 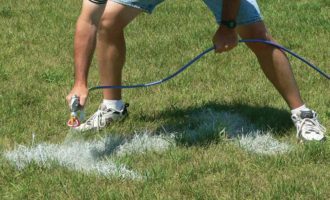 If you have to paint on damp or wet grass, it is better to use an aerosol that will ensure the paint sticks to the grass. 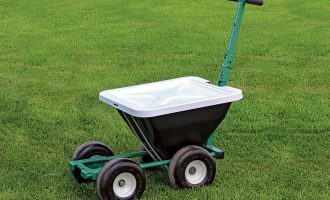 If you need to paint in cold-to-near-freezing weather, keep the aerosols warming in a 5 gallon bucket filled with hot water until you are ready to paint. 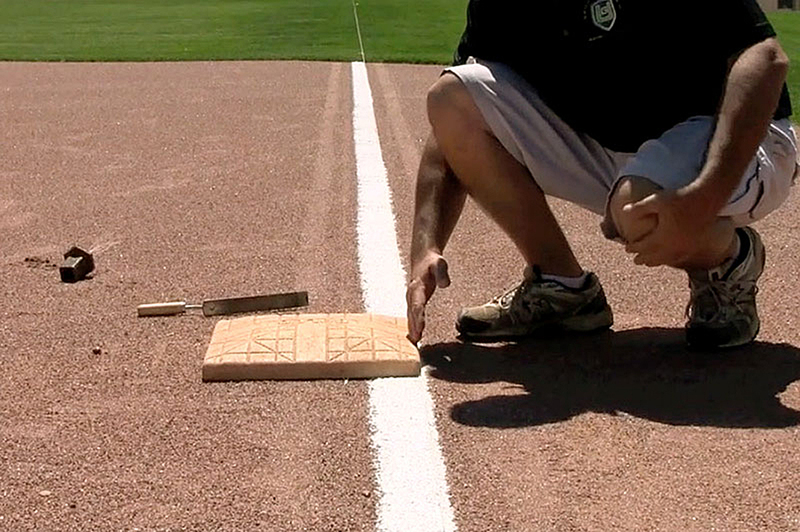 Paint or chalk, there’s always a few key things to remember. 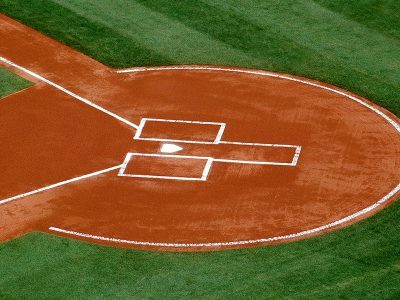 Log in to try this Pop Quiz before you continue on to the next lesson regarding laying out your ballfield.